Two days ago I was in my back yard, when this white thing flew by ...... I grabbed my camera and took a few shots. Well, it was an albino bird and I was so excited, I had never seen one before. I would like some help in identifying it. Some have said it's a Cardinal, others a Grosbeak, and some think it's a Sparrow, myself I'm not sure, but I really would love some help. Thank you Carolyn for sending us the picture of your mystery bird - I hope one of our readers can help identify it! June 2015 - we have had an albino sparrow flying around our deck and feeder for about two weeks. we live in the city of Kitchener. It is now comfortable with the other sparrows, that visit our feeding area and it visits quite regularly now. It is also becoming less "flighty" when the wood peckers, blue jays, cardinals, starlings and doves visit as well. 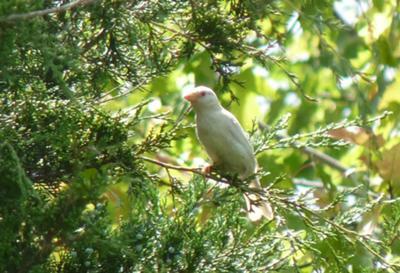 I live in Smithville and just saw an albino House Sparrow, no time for the camrea, it's September 2 2010. Thank you for all your help, I'm positive it's a House Sparrow, my neighbor had taken a few photos and The Albino Beauty is sitting with 5 little House Sparrows, other than being white they all look the same. Thank you and mystery solved! The news back from Cornell Labs is that the bird in the photo could either be a House Sparrow or House Finch. They suggest to watch the other birds that it spends its time with, and listen to the music it makes. This is info about a Song Sparrow, plus the sound it makes. Here is a bit on House Sparrows and how they sound. Thanks for the info Sara, I now know where to go when I have a question about birds! Thanks for your help, a friend of mine told me it's a Sparrow. He said it has been hanging around his farm, it's seems to like his mulch pile. I hope he's right but finding out for sure would be nice. I have been checking some of the other sites that I visit and was recommended to ask Cornell labs. I sent them an email with your picture of the bird (I did not use your name), so we will see what happens next. http://community.birdsandblooms.com/forums/p/294664/3355240.aspx - you may have to paste this in your browser, but this site is full of information. I am asking another site and will let you know what info they come up with.